This morning, Fast Company Co. 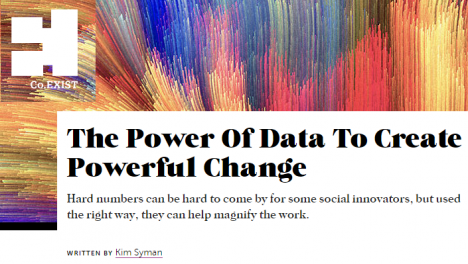 Exist ran “The Power Of Data To Create Powerful Change.”, the third installment of my social innovation optimism series “7 Reasons for Social Innovation Optimism." In this piece, I take a look at high-impact organizations across the social sector, including New Profit grantee Family Independence Initiative, that are experimenting with inventive uses of data. These organizations have made significant progress on using data in deeper ways and on an on-going basis, yet we are still very much at the beginning of understanding and utilizing data for social impact. It’s exciting to think of what the next revolution in the use of data could bring, such as real(er)-time access to data that complements what organizations learn from more formal evaluation frameworks. "Data is among the most powerful, under-utilized, and incompletely understood forces in social problem solving. The time has come to wrap our arms around it, redefine it, and find its full potential for driving better human outcomes."